We’re coming down to the wire for the office weight loss challenge! As I mentioned last week, I’m not going to take home the big prize, but I am happy with my progress. We haven’t had our official weigh-in this week, so I don’t have an update to report. But I’ve been working hard to add additional steps into my day and extra vegetables to my plate. Trying to fit in all these changes could be overwhelming, but I try to keep my expectations in check. One of the challenges I’ve been working on is scheduling my meals throughout the day. Days are long and it’s no fun to be hungry and cranky. On a regular day, I leave the house at 7:30 a.m. and leave work at 5:10 p.m., getting home at 6:30 p.m. That means that it’s usually 7:30 p.m. by the time dinner gets on the table. On class nights, I have class from 6:00 – 9:00 p.m. and get home around 10:00 p.m. On a regular night, that means that between lunch and dinner it could be 6 hours! That’s too long without a snack. On class nights, I eat a light dinner at 5 p.m. and even with a snack in class, I am pretty hungry by the time I get home. One of the issues with planning a ‘late night’ snack is that it is so close to bedtime. I don’t want to eat anything too heavy and certainly don’t want to start cooking something at that time of night. For me, I’ve found that a good option is a bowl of cereal and a piece of fruit. Growing up, whenever I couldn’t sleep or was just hungry for something after dinner, I often ate a bowl of Cheerios. For some reason it was comforting and I could always go back to sleep afterwards. 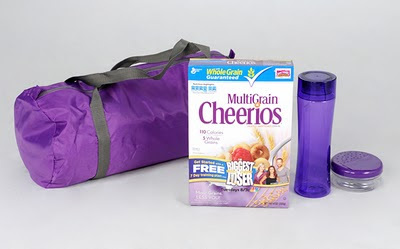 I recently received a box of MultiGrain Cheerios cereal, a gym bag, water bottle and cereal container from Cheerios (the product and information was provided through MyBlogSpark). In addition, the cereal box included and code to log on to the MultiGrain Cheerios & Biggest Loser website. Being a traditional, and sometimes Honey Nut fan, I was interested to try this flavor. And since Biggest Loser seems to work for the contestants, it can’t hurt to check out their online tools. I’ve logged into the site a few times. The site offers recipes, suggested workouts, and a 7-day plan combining menus and workouts. If you have no idea where to get started, this would be a good resource. I’ve also had a few bowls of MultiGrain Cheerios. 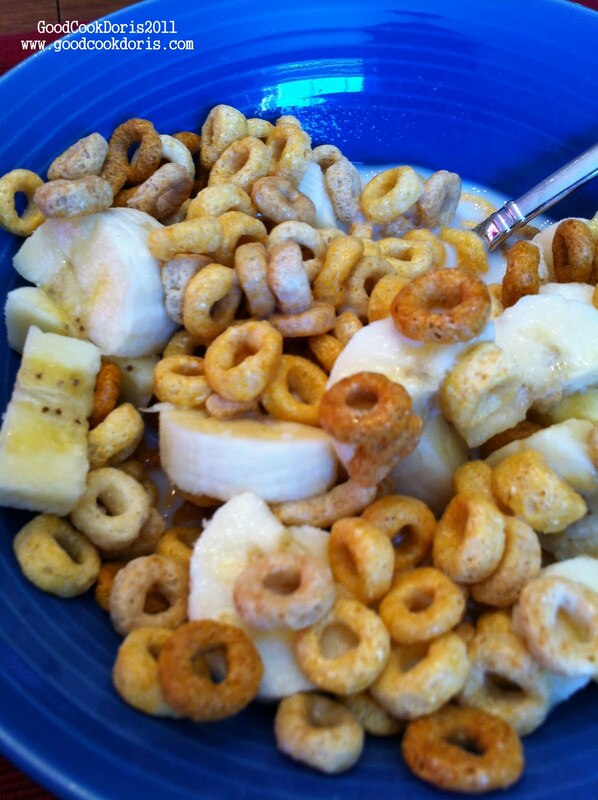 I’ll be honest – my favorite is always going to be plain Cheerios. The MultiGrain cheerios are lightly sweetened (only 6 grams per serving) and have a good mix of whole grains to fill you up. I sliced up a banana and poured in low-fat milk to top it off. I found it a little too sweet for my taste. But if you love sugary cereals, this will definitely satisfy your craving. For me, I’ll make myself a custom cereal blend with MultiGrain and regular together (loved doing this as a kid!). Cheerios offered to help one of my readers jump-start their Biggest Loser Challenge with a prize pack! The package includes a box of MultiGrain Cheerios with an online code, gym bag, water bottle, and cereal container. FYI - the bag, bottle, and cereal container are all purple (like the MultiGrain Cheerios box). The water bottle is huge - you'll never be dehydrated! Enter through Tuesday, March 1 at 9:00 p.m. Winner will be announced next Wednesday. Please leave a separate comment for each entry. You can enter up to three times. Disclosure: Cheerios provided the prize pack and information for giveaway via MyBlogSpark. All opinions belong to me. I received a prize pack, but did not receive any monetary compensation. I love Cheerios! I do like the multigrain ones but I also like the banana and chocolate flavors ;) I am pretty conscious of what I eat, and it's all about balance for me - if I have an indulgent meal, I make sure to eat lighter and healthier throughout the rest of the day. I also exercise pretty regularly. And I snack in between meals so I'm not starving when it comes to mealtime! Just recently I have been taking vitamins everyday, and replacing at least one cupcake with an odwalla bar. It's the little things. And, multigrain cheerios are mynFAVORITE! Great giveaway! I am drinking a lot more water! Stairs, stairs, stairs! That is my commitment to being healthier! And to do 1 week of food logging to see exactly what kind of calories I am taking in. We made a huge investment in an indoor bike this fall and it has helped me wipe out not having enough or not feeling up to working out after work. I also try to make enough healthy leftovers for dinner to bring for lunch the next day to avoid unhealthy lunch choices. I got the Cinnamon Cheerios from MyBlogSpark and they're fantastic. We've found that we're eating more healthy just because I'm cooking from scratch. It makes a big difference when fresh ingredients are used instead of those packed with sodium (and other junk). I used to just grab a small, unhealthy snack on my way out the door for work. Now, I get up 15 minutes earlier and eat either eggs, or cereal for breakfast each morning. SO much better for me! I need to try to get more exercise. Have become really lazy about that this winter.